It seems that since the beginning of personal computing, there has been a fairly high correlation between computer enthusiasts and wargamers. War games were plentiful on the 8-bit Atari machines, but a funny thing happened on the way to the 16-bit world: Fantasy role-playing games took over. How many real war games are there for the ST? A hard-core wargamer would snarl, "None," at this point. With a few exceptions, the ST owners have been left at base camp, so to speak. The scenario goes something like this: The land of Galanor has been a peaceful place for the past few eons. The fact that the Shadowlands lie nearby no longer bothers anyone because the Old Race that dwells within has kept to itself for as long as history remembers. Over the centuries, a few men have entered the Shadowlands, learned the secrets of sorcery and escaped with that knowledge. These men went on to become Sorcerer Lords. But now, the old Shadowlord has died and the new Shadowlord is hungry for power. His desire is to control the Rune Rings—ancient standing stones enchanted by the Old Race before man ever made his appearance. He has bred an army of wolf riders and warriors and has unleashed them on an unsuspecting world. Thus begins your stint as the Sorcerer Lord. You must take command of the combined armies of men, Elven Lords and barbarians in an attempt to stem the tide of darkness that threatens to envelop the land. Okay, before all you armchair generals out there dismiss this game as just another fantasy rehash, let me assure you that the Shadowlord forces are homogenous, while the effect of race on the "good" side is basically terrain benefits (i.e., elves fight better and move more rapidly in the forests than do other races). The game comes on one single-sided disk and is not copy-protected. Also included are the Player's Guide, a Reference Card for the IBM PC and Compatible/Atari ST/Amiga and a map of the Lands of Galanor. GEM lovers, be forewarned! As you may have guessed by now, you'll find no windows, no dropdown menus, and you can send your mouse to the cleaners. The entire game is keyboard-controlled (nope, no joystick either). I am curious as to why PSS didn't at least support joystick movement. As it is, you use the number keys (or numeric keypad) to pick up, move and put down your units. All in all, the interface felt IBM-ish to me. Yes, ladies and gentlemen, we have another port on our hands. 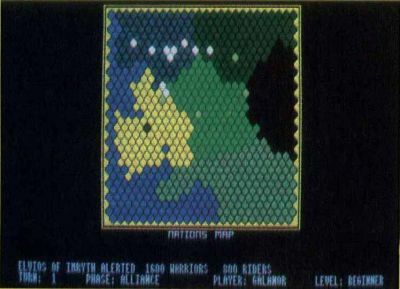 The battlefield is two screens wide by three screens high (each screen being about 13 by ten hexagons), is visually appealing and has an invisible hex grid superimposed upon it. The terrain is diverse, from desert to icy wastes. Also included are fortresses, citadels and Rune Rings. The battlefield does not scroll, but instead uses some sort of page flipping to change among the six segments. This can make coordinating attacks across the segment boundaries extremely frustrating. There are strategic maps available, and they will help a bit, once you learn to decipher them. The game is broken down into turns, and the turns into phases. Each turn represents one day. (Remember that; I'll be getting back to it.) The phases are Shadowlord Movement, Shadowlord Combat, Galanor Alliance, Galanor Movement and Galanor Combat. The Alliance phase is when reinforcements appear and when various Galanor armies are alerted. Only one scenario is offered, and the single option available to diversify the game is the choice of beginner, advanced and expert difficulty levels. 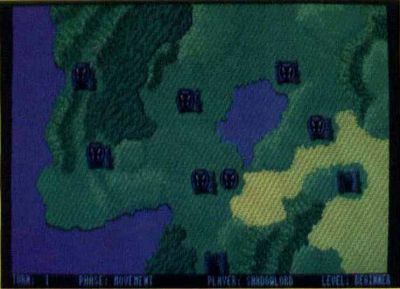 The game ends after 40 turns (at the beginner difficulty level), when all the forces of one side have been eliminated or when one side's citadel has been captured. At the start of the game, each fortress or citadel houses a leader and his designated troops; these troops are unable to move without their leader. Before a leader can initially move, he must be alerted either randomly during the Alliance phase or by the presence of another army. Each leader has a leadership rating and a sorcery rating. The leadership rating aids in combat, as might well be expected. The sorcery rating defines how well the leader can summon sorcery to aid in battle. Sorcery in the game is abstract, and I still do not fully understand it. Basically, each side will bring sorcery to bear on a battle; the effects range from weak to devastating. How much sorcery a leader can bring to bear is determined by his sorcery rating and by the distance to the nearest Rune Ring (so states the Player's Guide). Why is it, then, that when two forces do battle twice on the same hex, the levels of sorcery they summon can be totally different? And why is it that a leader with a strong sorcery rating, sitting on top of a Rune Ring, will sometimes bring only weak levels of sorcery to a battle? Beats me. This system needs either more work or more explanation. The general rules of wargaming apply here: A unit must stop movement when it enters a hex containing an enemy unit. A unit in a fortress or citadel receives a defensive bonus. A unit is forced to retreat when it loses a battle. All the stuff of which wargames are made. What's that? Did I hear someone ask, "What about stacking?" Is stacking allowed? You bet it is. Now let's figure out the scale of the game. If a turn is one day and the average distance an army can move in one turn is five hexes, then how big is a hex? Lessee...figure your average foot soldier can march at five miles an hour for eight hours a day. Sounds like 40 miles a day to me (and yes, I know that he'd be one hell of a tired soldier). Divide that 40 miles by five hexes, and you get eight miles a hex. What's the point? There is no stacking limit and the game's artificial intelligence routinely builds stacks of 40,000 or more troops. How does a 40,000-strong army fight in an eight-mile space? And therein lies the real rub for me. When playing Sorcerer Lord, you will see no lines of battle drawn. The war quickly degenerates into a disorganized game of cat-and-mouse, with each player's monster stack trying to catch a smaller enemy stack. Silly to watch, not much fun to play. I can't think of any way to win this game "traditionally." The Shadowlord side rarely splits a stack and by about the tenth turn will have concentrated the entirety of its forces into one or two hexes. I also must add that the Shadowlord forces can move up to seven hexes per turn and are not slowed down by most terrain. What compounds this particular problem is the "capture the flag" victory condition. If the Shadowlord's forces take your citadel, the game is over. The reverse is also true, but your forces only move an average of five hexes before terrain penalties. And there are yet more problems. There is no Undo function. Once a unit is moved, that move cannot be taken back. There should be an opportunity to retract a move while still in control of that unit. Also, following the movements of the enemy troops is disconcerting. There is no way to tell a single unit from a stack of ten units, and the pieces do not slide across the board, but rather vanish and reappear in the next hex. Since they all look identical, it can be difficult to ascertain which unit is moving where. Lastly, after a game is finished, the program ends. You have to reboot if you want another go at it. If I sound dismayed by this game, it's because it could have been what so many of us are looking for. Had the user interface been more polished, a stacking limit imposed and a choice of scenarios offered, Sorcerer Lord might well have been a fine game. As it stands, I see little to recommend it.